The AMIR bias lighting strip kit will offer high brightness and light up the background of your TV or monitor, reducing eyestrain and offering diverse colors and modes for ambient lighting. The attached remote control enables you to control it easily within the control distance of 8-10m. Step 5. Connect the USB connector to the USB port of your PC to power on. 16 Colors & 4 Modes: The TV backlight strip which has 16 different static lighting colors and 4 lighting modes to meet your diverse demands. You can simply control the lighting colors or modes by the remote control. The transmitting distance can be up to 8-10m/26.2-32.8ft (opening area). 24 Key Remote Control - 16 Colors, 4 lighting modes, all you can change that through remote control. 24 buttons, 2 brightness adjustment keys, 2 speed adjustment keys, 2 switch keys (ON/OFF), just one press will get your favorite color and light mode. 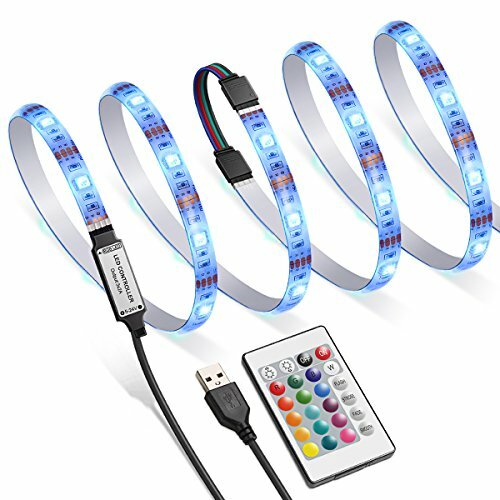 High Brightness & Reduce Eye Strain: The AMIR 30 led strip light enables you to add background light and adjust brightness when watching TV or working on your computer. Additionally, it helps reduce your eye strain for long exposures to TV screens or monitor in the dark. Safe & Pre-Cut: This LED light strip kit has been pre-cut in 4 sections. You can connect it with connecting cables in different installing method as you prefer(Distinguish positive and negative according to the arrows). It's powered via 5V/ 1A USB port directly, which is easy and safe to use.